I thought TARP was the sleaziest-ever example of cronyism and corruption in Washington. The Wall Street bailout rewarded politically well-connected companies, encouraged moral hazard, and ripped off taxpayers. Heck, it was so bad that it makes the sleaze at the Export-Import Bank seem almost angelic by comparison. But I may have to reassess my views. One of the provisions of Obamacare allows the White House to give bailouts to big health insurance companies. You’re probably wondering why these big firms would need bailouts. After all, didn’t Obamacare coerce millions of people into becoming involuntary customers of these companies? That should give them lots of unearned profits, right? But here’s the catch. The President wasn’t being honest when he repeatedly promised that Obamacare would reduce premiums for health insurance. And since the Democrats don’t want consumers to get angry about rising costs (particularly before the 2014 elections), they want health insurance companies to under-charge. Avik Roy of Forbes explains in greater detail how the White House is coercing health insurance companies to limit premium increases before the mid-term elections. Here are some excerpts. Hidden in the midst of a 436 page regulatory update, and written in pure bureaucratese, the Department of Health and Human Services asked that insurance companies limit the looming premium increases for 2015 health plans. But don’t worry, HHS hinted: we’ll bail you out on the taxpayer’s dime if you lose money. …The White House is playing politics with Americans’ health care—and they’re bribing health insurance companies to play along. The administration’s intention is clear: Salvage the 2014 midterm elections. …Technically, the regulations don’t force health insurance companies to tamp down their premium spikes. But the White House isn’t asking nicely. …Under Obamacare, insurers are so heavily regulated that they have to play nice with the bureaucrats who call the shots. …If insurance companies don’t give in, regulators have powerful ways to make life hard for them. A shrewd CEO doesn’t need to look far to see what might happen if his company opts out. 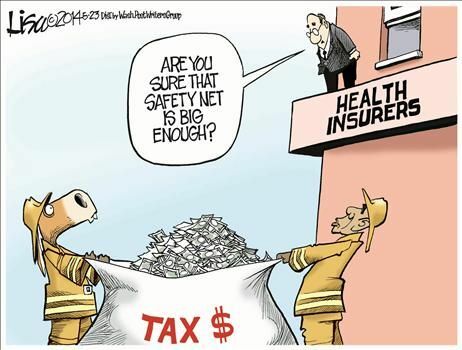 But before you feel sorry for Big Insurance, remember that these corrupt companies supported Obamacare and fully expect to get bailed out by taxpayers. Here are some blurbs from an article last month in the Weekly Standard. Most Americans don’t think it’s their job to bail out insurance companies who lose money under Obamacare, but that’s exactly what’s poised to happen. Obamacare’s risk-corridor program — which President Obama has been using as a slush fund to placate his insurance allies and keep them quiet about his lawlessness — shifts financial risk from insurers to taxpayers. According to the House Oversight Committee, health insurers expect Obamacare’s risk corridors to net them nearly $1 billion, at taxpayer expense, this year alone. …It was a win-win that would boost Obamacare in its early days — to the benefit of those who’ve gained extraordinary power at the expense of Americans’ liberty, and of those whose product has become mandatory for Americans to purchase. In other words, we have a stereotypical example of Mitchell’s Law. Government screws up something, and then uses that mess as an excuse to impose more bad policy! This Lisa Benson cartoon is a perfect summary of what’s happening. P.S. If you’re in the mood for some dark humor, here’s the federal government’s satirical bailout application form. P.P.S. Switching to a different topic, it’s time for me to rectify a mistake. When I first created the Moocher Hall of Fame last year, I didn’t include the “Octo-moocher” as a charter member. After all, having 14 kids while living on the dole didn’t seem particularly noteworthy. But now we’ve discovered that she could afford her kids. She just wanted other people to pick up the tab. Octomom Nadya Suleman pleaded no contest Monday to a single count of misdemeanor welfare fraud for failing to disclose income she was receiving from videos and personal appearances while collecting more than $26,000 in public assistance funds to care for her 14 children. This may not be as impressive as the deadbeat who got handouts while living on a $1.2 million yacht, but still worthy of membership. Subscribers do not have a choice as insurance plans are through an employer! I have a close relative recently diagnosed with extremely rare bone marrow, RBC Condition that will require costly infusions 2x monthly and Anthem has been their carrier for years….They do not want to pay for this young man, father and a disabled wife due to a serious infection years ago…Anthem is 1 of the 10 Greed consumed companies and we must all contact our local and Congressional Representatives to stop this beating up on patients who are ill and in need of medical care…Greed, greed and more greed…AIG is one of the companies on this list of 10 and how well I remember that great bailout, they were about number 1 in getting money from Congress via taxpayers…And wasn’t long news reports of a sabbatical at luxurious vacation area and of course taxpayers footing bills…the millions and millions paid by patients subscribing to their health care plan become hostage to these vile greedy creeps that somehow have developed a twisted view of the needs of their subscriber/patients and their own avarice in extracting 10 million 50 million or like Angela Braly who just retired with a 100 million dollar package…I remember this broad in Indianapolis and had just moved to Indiana and news article about her not paying for a young man’s prosthetic after he lost his leg in an auto accident. It is disgusting and this sick system in America an maybe the world that all the money and wealth is at the top and they are sucking it dry leaving paying subscribers high and dry and sometimes dead by holding out so long the patients die…This is really sick! Dan I am in the insurance business and I agree with you 100%. I would like to mention that the medicare Advantage program is also a rip off ( from the republican side). In the beginning advantage plan insurance companies were to give the same or better benefits for 95 cents on the dollar that medicare would have spent. But they needed 114 cents on the dollar to get started. Then whenever the democrats wanted that cut down toward the 95 cent goal the republicans would say the democrats were cutting Medicare. I am not pro democrat. Just pointing out crony capitalism is hard at work on both sides.